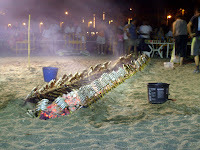 St. Johns festival is an event that happens every year in Nerja on the 24th of June and attended by people from all over the region to celebrate the fish! 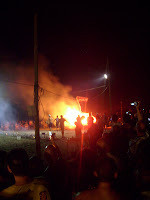 It's an all night affair where the locals come and camp on the beach, and it's apparently traditional for everyone to throw themselves into the sea at midnight. 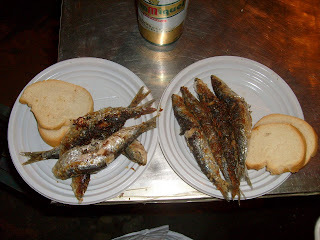 There were hundreds of people there with live music and a long barbecue pit where tons of sardines where flame cooked and then given out with bread for anyone who could be bothered to stand in the massive queue... The whole thing had a great party atmosphere and everyone seemed to be getting along great with no problems at all that I saw. A far cry (sadly) from any similar event in the UK. There was fireworks and (as you can see from the picture above) a big bonfire. After these were done we took our sardines (which were absolutely delicious) and went and sat on the beach to people watch. We had a great night and I'd definitely recommend this as a must do experience for anyone that happens to be in the region at the right time. There were all ages there from the very young kids tearing around, to the old folks having a fine time dancing to the bands. We thought we'd missed it but it turned out to have been moved back a day to make way for Spain playing in Euro 2008, and I'm very glad it was. An unforgettable part of our trip. For anyone interested in more pictures, check out my Flickr page.